Votes last week have decreased the likelihood of a ‘No Deal’ Brexit – we believe this is positive for risk assets in the UK. Thus, we have recently shored up a portion of our underweight to European assets, but we remain cautious on the region overall. Short-term and long-term uncertainty related to the fluid Brexit situation remains. 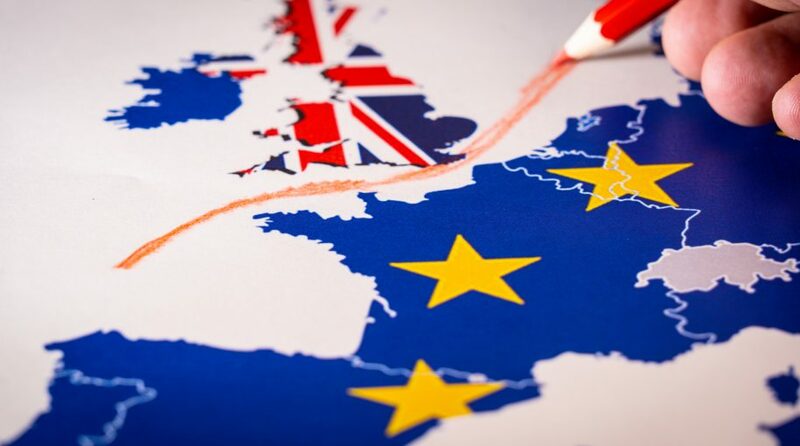 With a dizzying number of Parliamentary votes last week and less than two weeks remaining until the supposed exit date, the saga of ‘Brexit’ – the potential departure of the United Kingdom from the European Union – lurches on. Today we lay out Riverfront’s perspective on recent events and how they have affected our views and portfolio positioning. On the second page, we included a Brexit Appendix for readers who want to dive deeper into this British tragicomedy. While we can’t yet rule it out entirely, the likelihood of a disorderly ‘No Deal’ Brexit has decreased meaningfully – this is incrementally positive for both the pound and for UK assets. The House of Commons on Wednesday voted to rule out a ‘No Deal’ Brexit on any date under any circumstances. While not technically legally binding, it sent a strong political message that the UK Parliament is against the idea of ‘crashing out’ of the European Union without a managed exit. On Thursday, The House also handed Conservative Prime Minister Theresa May a Parliamentary mandate to request a deadline extension from the European Union. While this is dependent on the EU granting such an extension, we expect it will, as it is in both parties’ best interests. The extension will give the UK more time to either finally accept PM May’s plan, or to negotiate within Parliament for a ‘softer Brexit’ that moderate Conservatives, May’s Labour Party opponents, and Ireland could all support. This could resemble Norway’s deal with the EU (see Appendix for more detail). Portfolio Impact: As our own internal probabilities of a ‘No Deal’ Brexit have dropped, we have incrementally allocated capital to developed international, including unhedged UK and Eurozone stocks. Given the continued uncertainty of the situation, a portion of these additions included lower-volatility, higher-quality international equities. Brexit’s ultimate impact on the UK and EU will remain unclear for years to come… if Brexit even happens at all. This story isn’t over: Riverfront places approximately a 60-65% probability that some managed deal eventually gets signed, 30-35% probability of a second referendum vote that could nullify Brexit in its entirety, and less than 10% probability of a ‘No Deal’ Brexit. However, ongoing uncertainty has likely already taken a toll on the UK. Survey data from UK financial institution Lloyds Bank suggests that business optimism has plunged to its lowest levels in a decade. 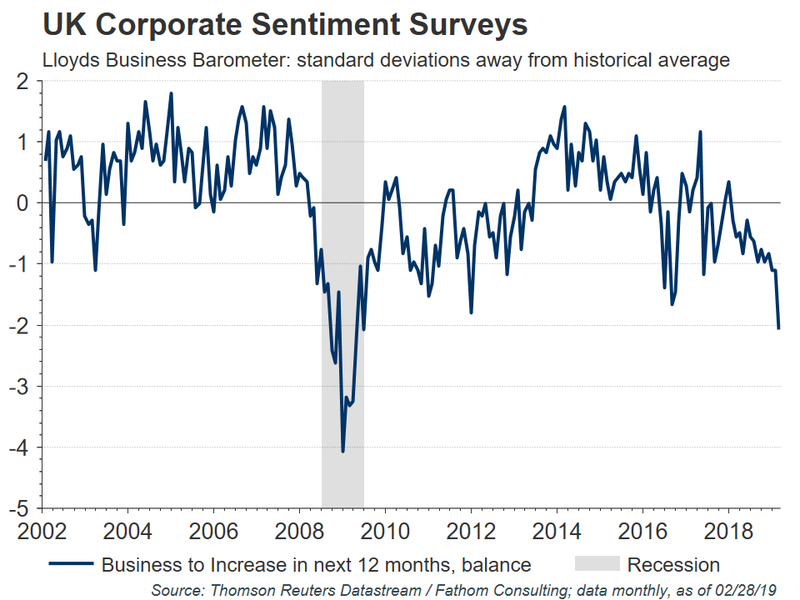 (Right Chart) In addition, there is an increasing trend of large financial employers moving jobs permanently out of the U.K. We would prefer to see some signs of sentiment stabilizing before getting more constructive on the region. Portfolio Impact: Brexit has strained both UK and broader European economies and sentiment – one reason for our longer-term caution on the broad European region, despite undervalued currencies and markets. 1. WHAT COULD HAPPEN GOING FORWARD? 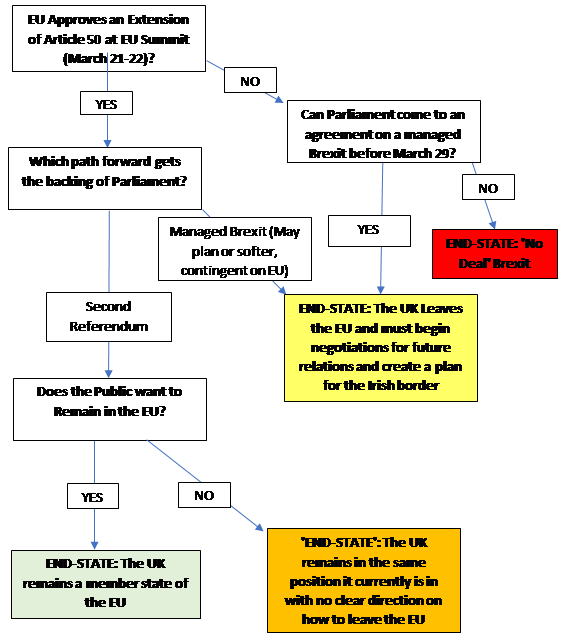 The flowchart below maps out the current possible ‘end-states’ of Brexit, in our view. The color-coding indicates Riverfront’s opinion of UK stock market and currency reaction; the lighter (more green) the shading is, the more positive for risk assets. An unmanaged No Deal Brexit is by far the most negative for both, though we also view this as a relatively low probability outcome, at this time. We believe it is also important to keep in mind that the EU may be unwilling to negotiate with an unreliable UK government since the EU has incentive to not appear too accommodating, lest other countries start to devise their own EU exit plan. 2. WHY DOES THE IRISH BORDER MATTER? The UK’s only land border exists between the Republic of Ireland (a member of the EU) and Northern Ireland (a part of the United Kingdom). This distinction is important because if the UK leaves the EU, Northern Ireland will leave with it. By nature of being an economic union and a single market, the EU has a frictionless border for both goods and people between their member states. However, between member and non-member states there are hard borders, complete with border crossings for passport and customs checks. Simply put, if the UK were to cease to be a member of the EU, border infrastructure on the Republic of Ireland- Northern Ireland border would need to be built and the free flow of goods and people would stop. Not only would the sudden friction at the border create an economic drag in the form of tariffs and border fees, there are serious political complications concerning the Irish border. The island of Ireland has struggled with internal conflict, since the formation of the Republic of Ireland, culminating in the ‘The Troubles’ of the late 20th Century and ending with the Good Friday Agreement. A hard border between the two nations would place a great deal of stress on this agreement and threaten the peace it upholds. As a solution to these potential issues, the EU has added an ‘Irish Backstop’ to its agreement with the UK. This ‘Backstop’ keeps the UK in both the EU’s customs union and single market through 2020, in order to keep the Irish border frictionless. What the ‘Backstop’ does not do is provide guidance or solutions for how to keep the border frictionless past 2020. This has led many members of Parliament to view the ‘Backstop’ as a way for the EU to trap the UK as a member state. However, no alternative has gained widespread support from either the EU or UK and the ‘Backstop’ seems to be the only solution for mitigating issues associated with the Republic of Ireland-Northern Ireland border. 3. WHAT MIGHT A ‘SOFTER BREXIT’ LOOK LIKE? May’s plan continues to prove unpopular with even moderate members of her own party, as well as Conservative ‘Brexiteers’ and the Labour party – it has already been flatly rejected twice. One potential way forward to Parliamentary acceptance could resemble the deal that Norway already enjoys with respect to the EU. While not being part of the EU, Norway is a member of various unions and agreements that recognizes what the EU refers to as the ‘4 freedoms’ of movement of goods, capital, services, and people. By remaining aligned with these EU market rules, Britain could avoid a crisis around the Northern Irish border. This is also the option that the government’s independently-commissioned research suggests is the ‘least bad’ Brexit option. However, a Norway-style agreement is not a slam-dunk for adoption since such an arrangement may leave Britain as a ‘rule-taker’ with less influence over the EU than what it currently enjoys. This may prove unacceptable to hardline pro-Brexit members of May’s party. 4. CAN BREXIT BE REVOKED ALTOGETHER? The short answer is ‘yes’. Article 50, the formal channel for leaving the EU, can be revoked unilaterally by the UK if Parliament has strong evidence that it represents the will of the British people. The likelihood of a 2nd referendum vote, which could provide that strong evidence, has increased meaningfully, in our opinion. Markets would welcome it, and many citizens, politicos, business leaders, and economists on both sides of the English Channel would likely breathe a sigh of relief at the prospect of a 2nd referendum, which might overturn Brexit. Many UK citizens did not fully comprehend the implications of the 2016 ‘leave’ vote due to the referendum’s vague wording. The campaign ahead of the vote was full of misinformation. The UK government is woefully underprepared and under-resourced for such an undertaking as Brexit. This all points to a ‘do-over’ vote. Indeed, Citigroup’s UK Equity Strategy team, referencing recent data from polling website YouGov, suggest a growing majority of UK voters now believe it was wrong to vote for Brexit in the first place; a stark reversal from polling two years ago (source: Citigroup, 3/12/19). However, while a ‘do-over’ may be the market’s preferred outcome, we’d note that this may have concerning social ramifications for the UK, as a 2nd referendum may confirm the worst suspicions of many disillusioned voters who voted for Brexit in the first place – namely, that European political elites disregard democratic ideals when it doesn’t suit them. There is also no guarantee that a 2nd referendum would produce any different outcome than the first; if the first vote taught markets anything, it’s that polling can prove unreliable as a predictor. When referring to being “overweight” or “underweight” relative to a market or asset class, RiverFront is referring to our current portfolios’ weightings compared to the composite benchmarks for each portfolio.